Last week I ranted over the M’s acquisition of Mike Morse. Though I still think Morse is a lousy outfielder and I’d prefer someone more athletic, I’ve at least come to understand the M’s moves a bit better. In my estimation the Mariners brass have positioned themselves strategically for the future again this year. They’ve acquired enough offensive talent to hold the attention of fans, while they give another year to evaluating their young talent. Will they be better this year? Depends on what other moves they make in the next few weeks. Because if they do nothing it will be a long summer. Mike Morse comes over from the Nationals. He’s happy to be in Seattle. Take that Justin Upton!!! They’ve definitely added some offense to the team. There’s no denying that Michael Morse and Kendrys Morales in the lineup every day adds something to the lineup. These are guys who have hit for power in the big leagues before and there’s no reason they shouldn’t hit in 2013. Having Robert Andino and Raul Ibanez come off the bench takes little of the sting out of losing Jaso (but not a lot.) The M’s big challenge is to increase their OBP as a team. Seattle was dead last in the American League last year at .296, a full 13 points below Toronto at next to last. Their young players have got to have more discipline at the plate. Unfortunately Morse and Morales are pretty much strangers to a walk as well, so don’t expect the new guys to lead the young guys out of the wilderness. But without having guys on base on, we’re just changing hats at the power positions-there have to be guys on base for the big boys to drive in. It’s all about ducks on the pond as Dave Niehaus used to say. Hopefully Kendrys Morales is as successful smashing the Angels as he was beating up on the M’s. Pitching is problematic to say the least. Felix is back. Good. Hisashi Iwakuma comes back for another year, and that’s good too, though he fills a two slot he probably isn’t really suited for. 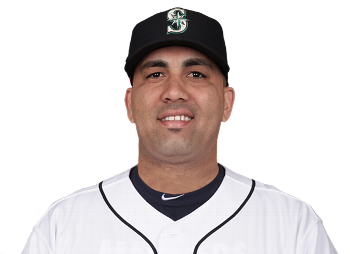 The Vargas trade for Morales, while useful for the M’s and the Angels blows a big hole in the Seattle rotation. According to the M’s press conference this week, Erasmo Ramirez, Blake Beavan, and Hector Noesi are slated to fill the remaining three slots. If that’s the case, it won’t matter if the M’s hit like the ’97 Mariners because they can’t possibly score enough runs to break even. That’s still a bunch of young guys who really need to be learning the game in the minors. Bringing in Kyle Lohse and Joe Saunders doesn’t sound like a bad investment to me, even with the Big Three + One getting closer to the big leagues. Look for the M’s to bring in somebody more veteran before spring training. Though the M’s have made some investments in offense, they’ve really only planned for this year. Though they could have put the big coin out for some long-term help in the outfield, which in my view they need, they’ve simply set themselves into a wait and see mode for 2014. Morales is a one year player. At this week’s presser, manager Eric Wedge indicated his support for Justin Smoak at first base. That means Morales is your DH, and likely a guy who won’t come back next year if he isn’t flipped for prospects in July. Morse is also a one year guy, though if he is good, I could see the M’s making an effort to re-sign him. Simply put, unless Casper Wells makes this team and has a great year in his reduced role, the M’s don’t really have a blossoming outfielder-in-the-making in the high minors. That’s one of the reasons I was really surprised they didn’t pick up one of the big outfielders available in Michael Bourn, Nick Swisher or Josh Hamilton. There’s nothing to suggest Jason Bay will make this team out of Spring Training. It’s his last hurrah. Ibanez is a one year guy. Which brings us back to everybody else. Jesus Montero, Smoak, Michael Saunders, Kyle Seager, Dustin Ackley, Brendan Ryan and Franklin Gutierrez all figure to return in starting roles. Because Jack Zdurencik didn’t invest in longer term players we get to re-start the clock from spring training 2012. You remember that time almost a year ago when we all agreed the M’s needed to see what they had in their young guys? Unfortunately, at the end of the season we all sat (okay a few of us sat) scratching our heads and muttered a collective “Hunhhh??! !” After we ran out of things to throw at the television. It was clear at the end of 2012 the M’s didn’t have enough power. It was clear at the end of 2012 management needed to give the kids a bit more time to determine what they had before they started looking around for more permanent answers. It’s also clear these young guys need to get better if they expect to have long careers in the major leagues. Some of that will come with experience, but for some guys like Justin Smoak it’s produce or you’re done. By adding a year’s of offense from guys like Morales, Morse and Ibanez, Zdurencik’s hopefully given the fans a summer of scoring that will make the games a bit more watchable while still providing an opportunity for the core of kids to continue maturing while he separates the wheat from the chaff. While all that’s going on, the up and comers in the minors get a little more time. How soon will the four headed monster of Danny Hultzen/James Paxton/Taijuan Walker/Brandon Maurer be ready to pitch at Safeco? I dunno, but my concern is if they don’t do something serious with the big league rotation the temptation will be to press one or more of them into service before they’re ready and then we’ll be questioning their future just like we did last year about guys like Montero and Noesi. Assuming the M’s add another serviceable catcher, Zunino will have time to grow in the minors, though all the signs from this week’s press conference point to a mid season call-up (which I also think is a mistake. For god’s sake catcher is the most demanding position on the field, let him learn it in the minors first!!) It also gives them time to figure out what position Stefan Romero can play. If it is the outfield, the M’s may have some help. Lots more questions, but I still think the M’s have used the offseason to buy themselves some time with a little offense, while they still sort out this painful process of rebuilding. 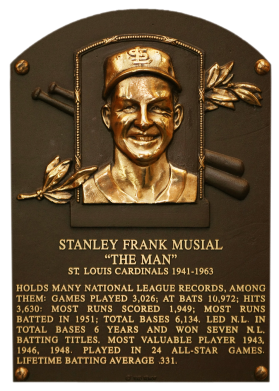 Stan Musial was inducted into the Baseball Hall of Fame in 1969 on the first ballot. Baseball is a great game filled with amazing moments and great characters. Some of them are remembered for their flaws and are tragic figures like Shoeless Joe Jackson or Pete Rose. Others are remembered for their greatness and their magic on the field like Willie Mays. Stan Musial is remembered for his consistent excellence that allowed him to amass over 3,600 hits and 475 home runs over a 22 year career for the St. Louis Cardinals. He played on some great teams and some not great teams, ending his career as young Cardinals like Bob Gibson, Curt Flood and Lou Brock were beginning theirs. Musial was the ideal ballplayer. He loved the game. Was a stalwart supporter of the Cardinals during his career and after. He never had the adversary relationship with the press his contemporary, Ted Williams, helped create. He wasn’t remote from the press, the fans, or his teammates as DiMaggio did. Musial was simply a great player and a great person. He was three time MVP, a seven time batting champion. He is so admired in St. Louis, there are two statues of him outside the new Busch Stadium. One of my most cherished pieces of baseball memorabilia is a signed Stan Musial Perez-Steele card. 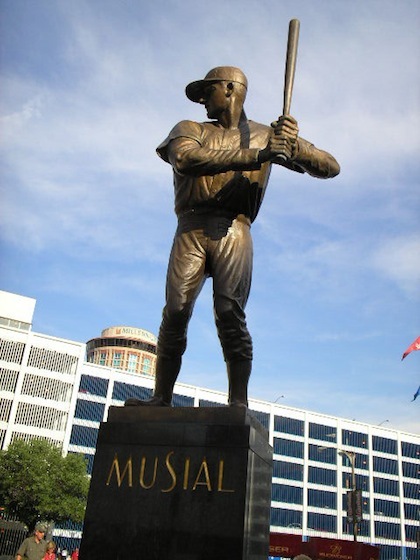 This statue in St. Louis is not widely admired because it doesn’t accurate depict Musial’s unique batting stance. Today the Mariners traded away left handed hitting catcher John Jaso for right-handed outfielder Mike Morse. Over on USS Mariner Dave Cameron is trashing the trade based on value. Cameron is right to trash the trade but one doesn’t have to crunch the numbers to wonder what the hell Jack Zdurencik is thinking. John Jaso was arguably the M’s best hitter last year. Maybe not in terms of cumulative stats, but in his 361 plate appearances he had a slash line of .276/.394/.456 and led the team in OPS. His OPS+ was 144, also team leading and last year had a WAR of 3.3. Jaso played catcher, a real position, DH’ed, and provided plenty of late inning heroics with clutch pinch hitting. More than any other Mariner, he took a mature approach at the plate, worked the strike zone, took walks when they were there, and was willing to take what the pitcher gave him. Jaso wasn’t much of a catcher, but he also wasn’t terrible. Jaso was a valuable player, relatively young and still under team control. He wasn’t a guy that was going to make the team a winner, but he was a useful piece. When last we saw Mike Morse, he was being helped from the field after tearing the labrum in his left shoulder diving for a ball on April 22, 2008 against the Angels. The Mariners tried to move him from the infield to the outfield with disastrous results. Eventually he was traded to the Nationals for the immortal Ryan Langerhans, and in Washington he made a career for himself. In 2010 he hit .282/.359/.519 with 15 homers in 293 plate appearances. 2011 was an even bigger year with .303/.360/.550 with 31 home runs in a full season. During those seasons he played mostly first base with stints in the outfield and DHed in interleague games. Last year, not so good. Fighting through a back injury, Morse chiefly played in left and right field hitting .291/.321/.470 and 18 dingers in 430 plate appearances. Morse is not a good outfielder. Age 31, never blessed with an excess of defensive acumen, he is often mistaken for a statue in the outfield corners (though he does move too quickly for birds to nest in his hair.) With the Nats’ signing of 1B Adam LaRoche, Morse became expendable. The Mariners, obviously frustrated by the failure of.the Justin Upton trade have become desperate for a bat, any bat. This team is now loaded with wannabe sluggers, former sluggers, aging sluggers they hope will kindle some offensive spark under this boring, low scoring team. However, in constructing this roster, Jack has catered to the lowest strata of the blog forum denizens-those who forget that baseball is not the same as Home Run Derby. It is an athletic contest played by athletes who must do more than try to swat a baseball 400 feet. Added Robert Andino-can play 2B, SS, and 3B, hits enough to be valuable; check off utility player. Added Jason Bay-recently released from his massive contract with the Mets, Bay hasn’t played well the past few injury-riddled years. Hoping to catch some lightning in a bottle with the M’s. Needless to say, my breath is not held. The corner outfielder is one of those low risk/high reward guys Zdurencik loves. Added Kendrys Morales-Adds power to the lineup; can play 1B/DH, but not much else; power upgrade-check. Subtract Jason Vargas-puts 200 inning hole in the starting rotation. Reliable starters reduced from four to three. Uh-oh. Added Raul Ibanez-can play either corner outfield spot, badly, on his 40 year old never terribly swift legs. Or can DH or play 1B Adds some power, leadership and experience. What should I check? 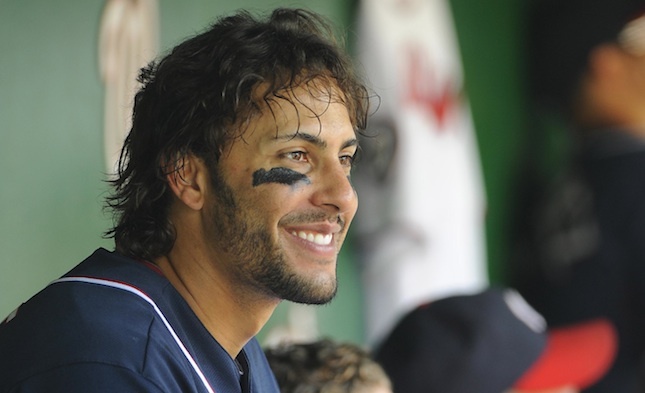 Added Mike Morse-Not much of an outfielder, can play 1B/DH. Adds offense, though we’ll need to see if he recovers from a down 2012 season. Power upgrade, but at what is now a crowded 1B/DH and scary corner outfield situation, what do I check? Subtract John Jaso-part of the catching platoon. Jaso was the M’s best hitter last year in limited at bats. Hits lefties poorly. Opens the spot for another catcher, maybe Zunino later in the summer, but we don’t have another catcher right now. Oops, new need, catching partner for Jesus Montero. Next a look at the M’s outfield defense and what it might mean for Mariners pitching.